The former Goodyear Factory in Belvedere, St. Thomas became our primary candidate site for the development of Jamaica's first International Level Motion Picture Production Facility. We have negotiated a favorable 25 year lease on the property which will allow us the time necessary to both develop the physical infrastructure as well as the human infrastructure to make the facility a success. The facility has since been dubbed “The Factory” by our project team. A name that reflects not just the history of site but also acts as a declaration that the Creative Industries are truly an industry. One that is capable of producing quality products and personnel for a growing global market and will grow to become a significant contributor to local and regional economic and cultural development. The primary attraction of the facility will be our sound stages. These are large, environmentally controlled open spaces for production work. Sound stages allow productions to shoot uninterrupted by weather and other sources of interference for long periods of time. Productions can engage in multi-day/week shoots without the costly daily setup and tear down associated with shooting on a location or in a makeshift unsecured space. The main sound stages are expected to be on average around 100 x 150 feet (15,000) square feet, with the capability of connecting multiple stages into one larger sound stage giving us the ability to cater to productions of all sizes. This will be accompanied by smaller stage facilities aimed specifically at 'New Media' production and productions which do not demand a full sized stage. Each stage will supply approximately 1600 - 2000A of stable power for production use and the majority of the stages will be insulated against outside sound sources, allowing productions to reap the maximum benefits from on-set audio recording. Each stage will be environmentally controlled through a sound attenuated HVAC system allowing for a comfortable work environment even under heavy light usage. Large ground level loading bays will allow easy access to the stages for the loading and unloading of equipment and set. Attached to each stage will over 2500 sq ft of ancillary space including makeup rooms, dressing rooms, green room, storage/utility and production control rooms. The existing administrative building on the compound will be redeveloped as the centre of what we have termed a “Creative Hub”. This hub will feature a wide range of production related facilities such as, production offices, editing suites, recording studios,“Creative Spaces” , Rehearsal studios, new media production facilities along with conference and screening rooms. “Creative Spaces” are non-traditional meeting areas geared toward the stimulation of idea creation. The idea is to allow groups of creators to meet in a less restrictive setting to facilitate brainstorming sessions. The walls will be dry-erase surfaces allowing for the free flow of ideas. Within the Hub will be 5200 square feet multifunctional studio space. This will be divided into two 2000 sq. ft and three 300 sq ft spaces. These will be specifically targeted at the development of new media products. Additionally, there will be many non-traditional shooting spaces scattered throughout the hub. Housed in the production hub are production office spaces allowing productions to make The Factory their home. All office spaces will come furnished with dedicated internet and telephone connectivity already in place allowing productions to easily transition in and out of our facility with minimal effort. Office space will be offered to local production companies and service provides at reasonable rates to encourage occupancy. Offices will be fiber-connected allowing the fastest possible internet access and allowing for productions to have dedicated internet access as well as being able to support data intensive applications such as live streaming. Another crucial aspect of bringing productions to the facility is the ability to support the entire production pipeline, from conception through to delivery. Therefore it is necessary for the establishment of modern post production facilities. The Factory will host a dedicated post-production and visual effects facility. This will feature multiple editing, visual effects and color correction suites, allowing work on many projects simultaneously. All the suites will feature industry standard software from companies such as AVID, Adobe and Autodesk. The post-production facility will also feature a massive central storage and archival system. Allowing for productions to have greater reassurance against the loss of their footage during the post production process as well as having long term archival options without having to shoulder the massive costs of such systems. Jamaica has a long history with the recording arts as music and radio continue to play a major part in our cultural landscape. We will embrace the full breadth of possibilities that are available in audio production. Sound design is an often overlooked yet essential, aspect of creative production. While advances in technology have allowed greater accessibility to produce audio for some applications taking many the studio into the home. There remain many applications of audio production which require highly specialized facilities for development and production. The Factory will be home to the first of its kind in the region dedicated audio production facility. Built from the ground up for audio, this facility will feature dub stages, foley stages and recording studios. These facilities will focus on everything from motion picture sound design to musical production. We hope to make the facility one of the few Dolby certified facilities in the world, thus allowing Jamaican sound designers, engineers, musicians and composers a platform to showcase the talent that exists here in areas that we are not yet known for as well as exposing them to different opportunities and applications of their skill sets. One of the goals of the development of The Factory is that of sustainability. Our operating costs will have to be such that the facility can be both competitively priced while showing profitability that will encourage further investment and development. In Jamaica, Energy remains one of the major costs of operation of any business. Although great strides have been made in energy efficiency, the demands of such a facility remain high. Energy infrastructure will be a hybrid renewable energy system, blending both solar and wind. The solar array will take advantage of Jamaica’s consistent supply of sunlight along with falling costs and greater efficiency in the required infrastructure to provide a supply of ~2MW promising a return on investment in 5-10 years. Wind generation will provide redundancy to the solar system, supplementing where there are shortfalls in generation. Both systems will be tied into a battery system which will stabilize the power profile of facility and provide power redundancy in the case of failure of sources. This system will allow clients to maximize their time at the facility without costly interruption. It will also allow scalability of the project as we will be able to quickly address the energy needs of a growing facility. With the world having moved firmly into the digital age, the creative industries are no different. Internet infrastructure is important to the success of this facility. Clients will require reliable, high speed network and internet connectivity for a variety of activities ranging from delivery of content to clients to live streaming. The facility will feature local shared WIFI for general usage, along with dedicated internet ready connections in all production offices and soundstages. Connectivity for the dedicated connections will be turnkey and facilitated through local internet service providers. As part of our post-production facilities, the facility will feature a high speed internal fiber optic network with a central media server serving both the post-production suites and for archival purposes. ‘The Factory’ represents the first major infrastructure investment for film and television in Jamaica and the wider English Speaking Caribbean. However we have recognized that there still remains a significant lack of capacity within the local film industry. Therefore, to maximize the benefits of having a facility of this scale, we must invest in the development of the local talent pool. While several local education programs exist, they lack the resources and flexibility to focus on the more technical aspects of motion picture production. Additionally, their program length and bureaucratic restrictions hinder the ability of local programs to maintain the pace of development to remain astride of our ever evolving industry. International education options exist, however, there exists difficulty in both the financial obligation to foreign education as well as the difficulty many residents face with clearance to travel outside of the Caribbean. From this perspective Reelvibez Studios endeavors to establish a local educational facility primarily in the field motion picture production as part of the proposed facility. To achieve this goal we require an educational partner that fulfills our goals of not only providing the standard of training required but who also provides a progressive program that can keep pace with the industry. We are looking to approach this project under an “Open Campus” model where students would be able to blend Online and in person course experiences into short intensive modular programs with offerings of undergraduate certification and eventually Associate Degree programs. Another focus will be continuing education workshops and master-classes for those already within the industry. Allowing active members of the local industry to enhance their knowledge base without needing to disconnect from the industry for extended periods of time. As this will be part of a functional commercial production facility, this will allow our program to utilize the most up-to-date equipment and technology available. This also offers opportunities to offer our courses as supplemental to existing film and television production programs that do not have the resources or turnover to justify the expense on such equipment. Finally, by creating a larger productive base we will produce more candidates who will be able to go to the next step and better take advantage of further educational experience and expand their knowledge in the motion picture industry. For the industry as a whole the ability to host more international productions and foster the development of more local and regional content means demand will be created for local production staff. Local staff and talent means lower costs for productions as Producers will no longer have to face the expense of bringing in foreign talent for key production roles. At this stage It is difficult to truly determine the full employment potential and impact of the facility. 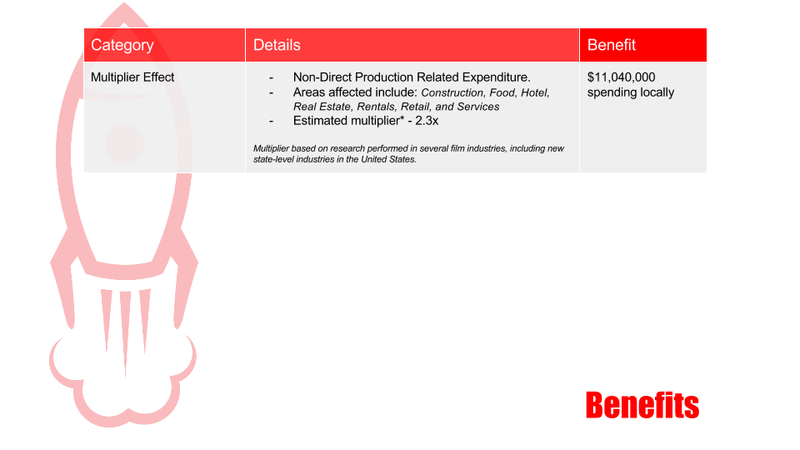 However, examination of other recently developed film industries and shows the impact of infrastructure investment and tax incentive plans have had. Adding over 10,000 Full Time Equivalent (FTE) jobs to Georgia’s Economy over a 5 year period and over 3000 FTE jobs to Louisiana’s since 2003. The Shooting of film/television production. Delivery & Marketing of the final production. Currently, Jamaica is incapable of supporting the entire value chain for production. The Factory will address this, creating the physical and human resources to fulfill the needs of the production pipeline. 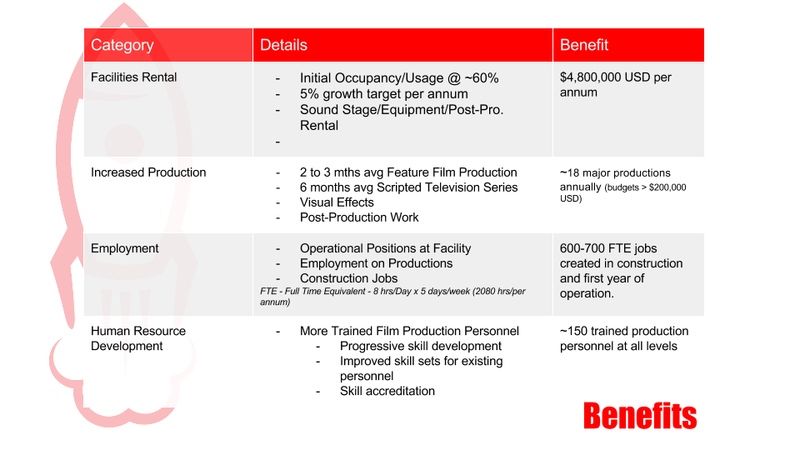 The more of the Production Pipeline that we are able to support locally, the greater the economic impact of motion picture production as each stage not only produces direct employment but also indirect employment in the creation of services that support the value chain. of that industry difficult. Due to its unusual and ever changing demands, the Creative Industries also offer a breadth of on the job skills training and experience that can be taken into any industry or occupation. Participants in the industry will be exposed to and develop a wide range of practical skills (e.g. Carpentry & Electrical) as well as developing higher level skills such as leadership and problem solving. Finally, the creative industries offer endless entrepreneurship opportunities. No one can predict where the next blockbuster film series, book, video game or hit song will come from. Nor can we predict where the next innovation will pop up. Unique problems requiring an innovative solution are a daily occurrence in the creative industries and we aim to put people into the position where they can seize those opportunities. Jamaica already has a large tourism industry and the Film will complement that. In recently developed film locations like Georgia, the popularity of locally produced shows such as “The Hunger Games” and “The Walking Dead” has lead to millions of dollars in tourism revenue for the state through film related tourism. A UK study showed that films showing the UK was responsible to 1 in 10 international tourists visiting the UK and some £1.8 billion in tourism spending. Jamaica has long been on the forefront of regional and global culture. Our music and culture continue to pervade and draw audiences globally. However Jamaica itself has not been able to tap into the full potential of this influence. With the establishment of a world class production facility we are giving our own creators a chance to show the world the full length and breadth of our creative capabilities. Locally, Jamaican culture is constantly drowned out by the presence of international media. Our local cinemas and television stations have a dearth of local content and even old shows that should have been archived have been long lost. We have to then look to the future of creating new content and preserving our own culture for the future and this facility will provide the platform to do so. The development and success of this facility is not just key to the entirety of Jamaica but more locally to the parish of St. Thomas and the communities surrounding “The Factory”. The facility offers an opportunity to revitalize a part of Jamaica that has for too long been neglected. From its very construction, the facility will offer employment and economic growth opportunities for a parish that is for all intents the poorest parish in the island. The unique and resilient nature of the creative industries even though the most economically perilous of times means that not only will the communities see economic growth in the short term but they can expect to see the facility as a key part of their lives for a long time to come.